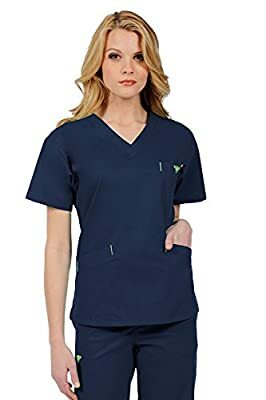 Med Couture's classic solid scrub top has a v-neckline. The 8403 scrub top by Med Couture has a ton of pockets for you to carry all of your gear. 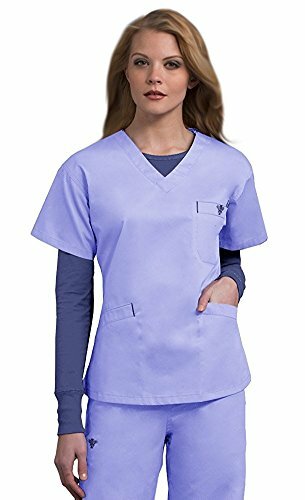 Med Couture's classic v-neck scrub top has a chest pocket with velcro and a badge holder. It also has two front angled welt pockets with invisible pockets inside of it! 55% Cotton/42% Polyester/3% Spandex. Med Couture's classic solid scrub top has a v-neckline. Chest Velcro pocket with badge holder Front angled welt pockets With invisible inside pockets Imported. Length- 26 inch. Machine wash.